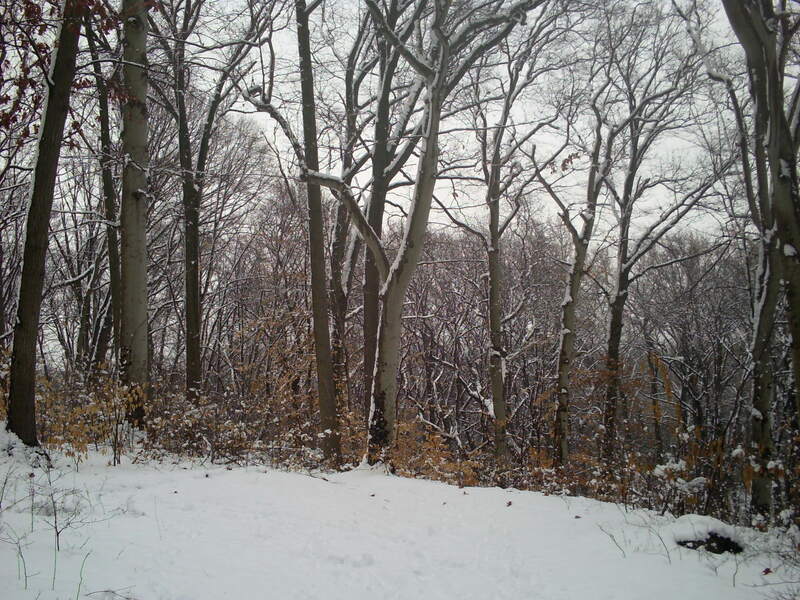 With large areas of the forest without tall trees, there is concern about the future of the forest canopy in the area of Morris Park we are focusing on. 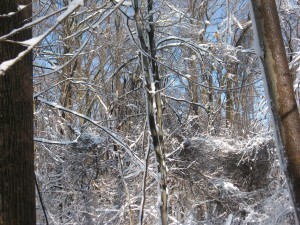 When the large trees are dying off one by one, and there are few mid-sized trees, a whole species of tree is blighted so badly that it never reaches even near maturity, and the small trees are under assault from the invasive vines, we wonder what it will take to bring this under control. We have seen other areas of the park that are further advanced in this process of environmental degradation. It was difficult to even access these areas, because the invasives were so prevalant, they created an impenetrable wall. We did manage to see them however, and it is not a pretty sight. No tall trees at all. The only trees were Ailanthus Altissima, the tree of heaven, covered in either the invasive exotics Multiflora rose(Rosa multiflora) or Japanese honeysuckle (Lonicera japonica). 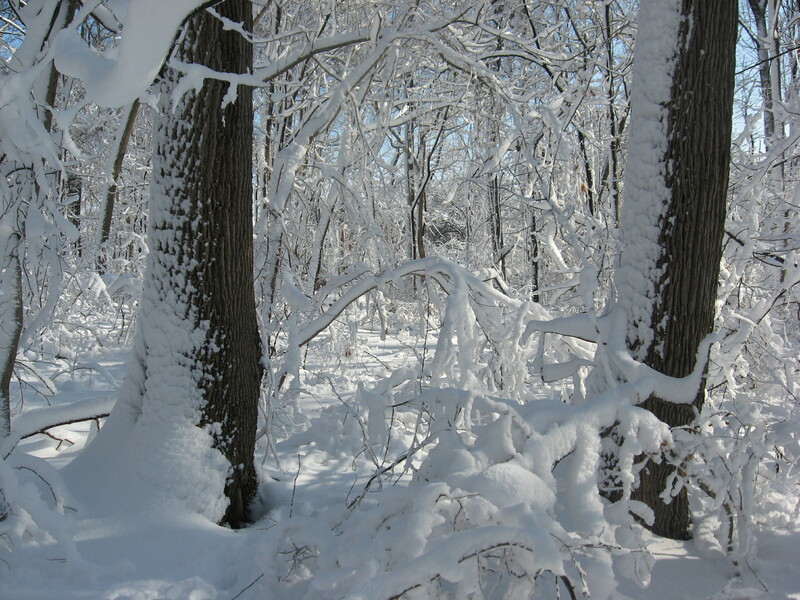 Mile-a-minute vine covers the dead tree trunks of the former forest. These areas do not look like a woodland at all. 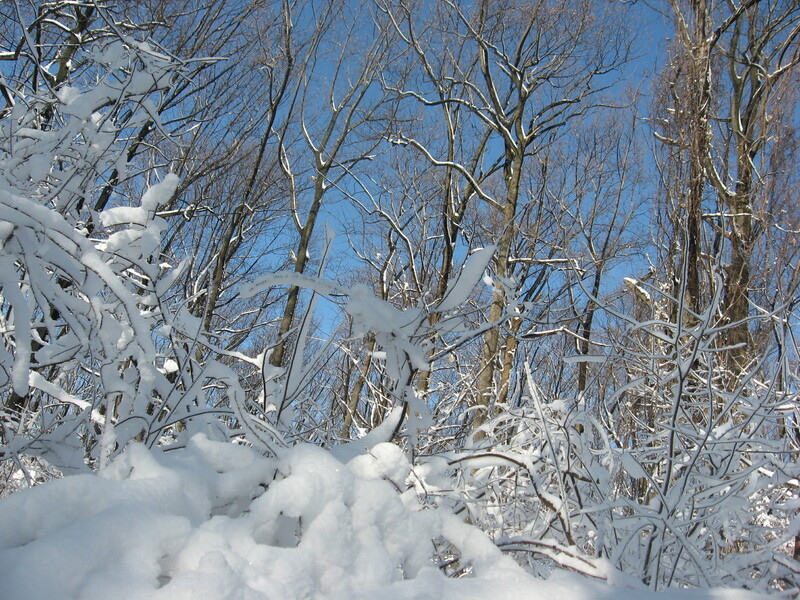 There are no herbaceaous plants on the forest floor . 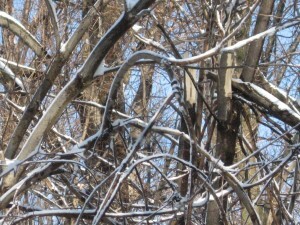 Everything is a dense thicket of invasive vines. 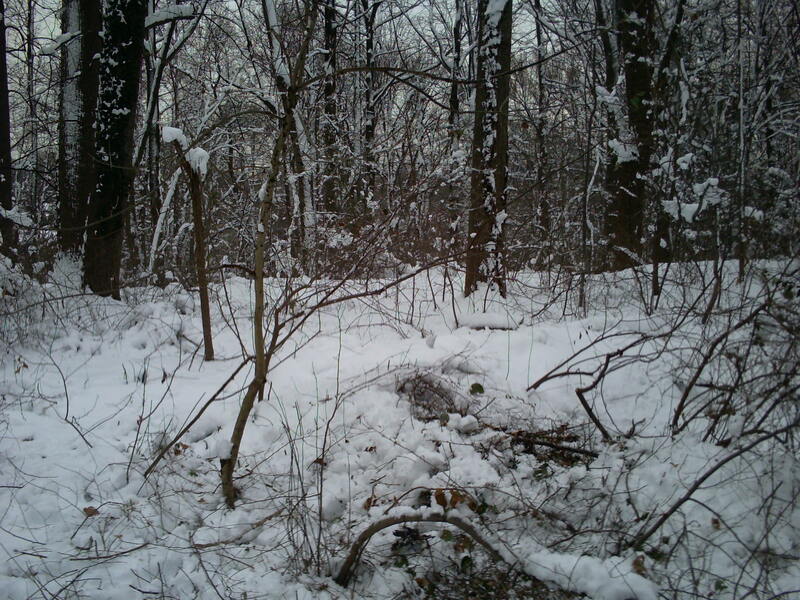 The area that we are concerned with is on its way to this final stage of forest destruction.There was this one area of Spicebush (Lindera benzoin) that looked especially at risk this morning. The shrubs were buried in the snow. 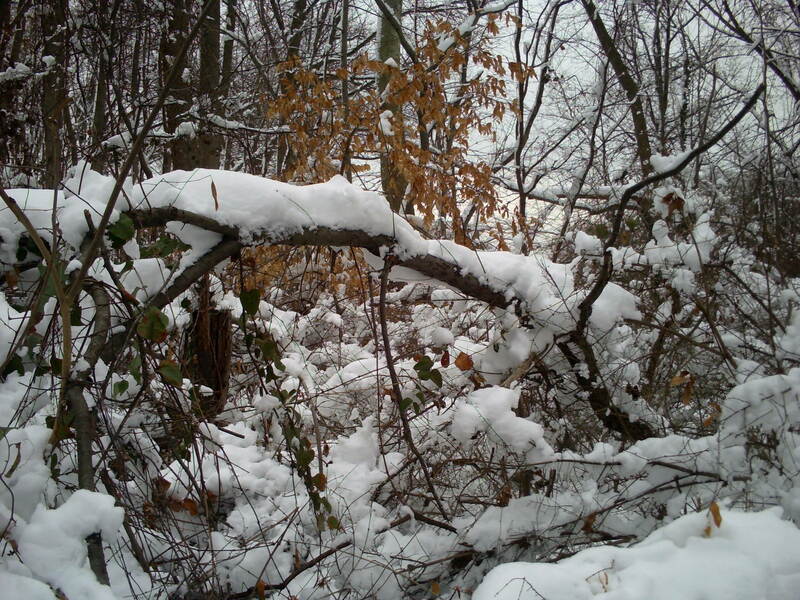 Spicebush nears breakage from invasive vines and snow weight. 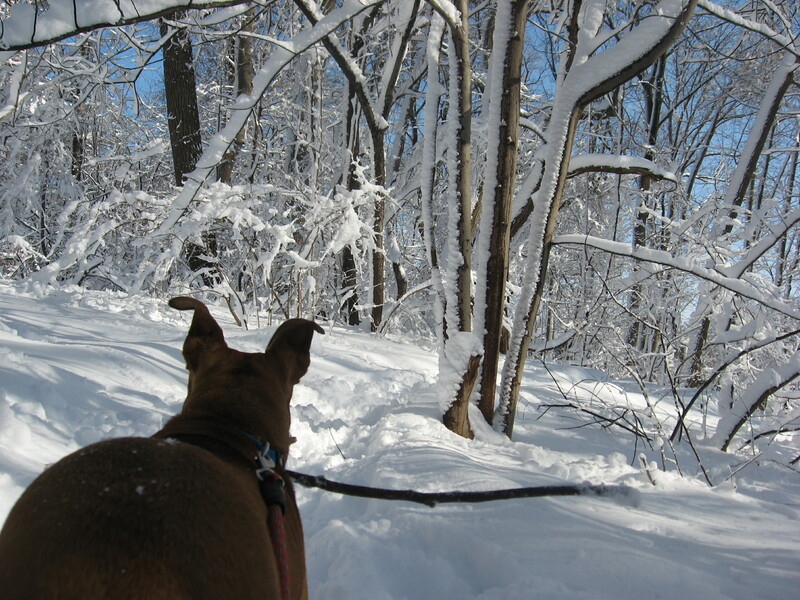 However, with 15 inches of heavy wet snow outside, the idea of going into the Park and off the trail (Which is used enough that the snow is compacted) was a bit daunting. However, cabin fever can be problematic, and it was worth a go to at least try to do something. This, above, is the “before” picture. This is the “after” picture. 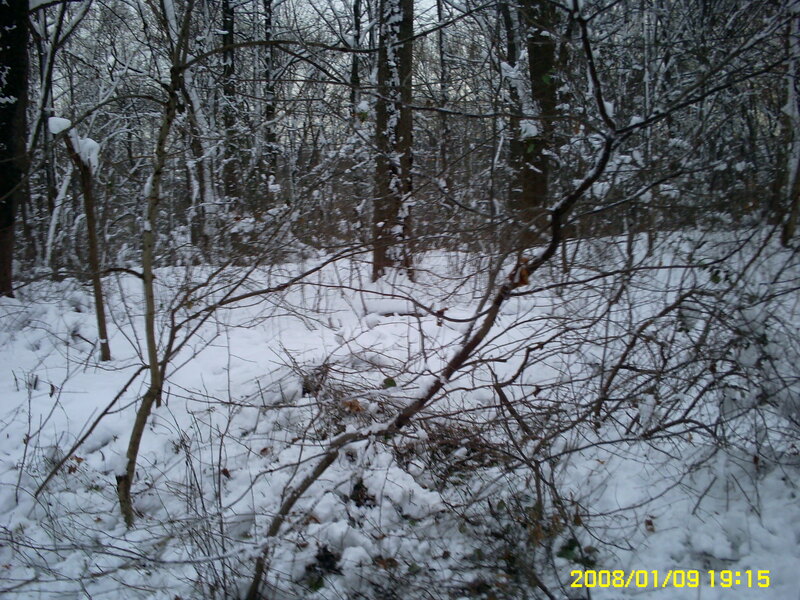 (date incorrect) The Spicebush just rose up from the snow and ice as the vines were cut away. It was very satisfying to watch the shrub spring back up to a vineless, healthy future. Hopefully tomorrow, there will be time to address this urgent matter. 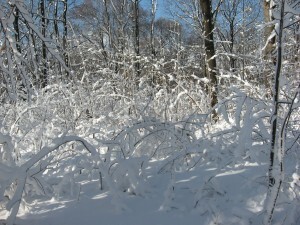 This 15 inch blustery event made the previous morning’s 5 inch “wintery mix” look like a harmless dusting. This storm was the real winter storm, not a December fluff festival that can be swept off the sidewalk with a broom. This was a heavy wet snow, that blew sideways and stuck to every surface it made contact with. It was accompanied with lightning and thunder. This is the snow that threatens trees that are covered with vines. Around 10:00 last night we heard cracking sounds coming from the park. They sounded like gunshots, popping off one after the other. I knew what they were from the direction of the sound. 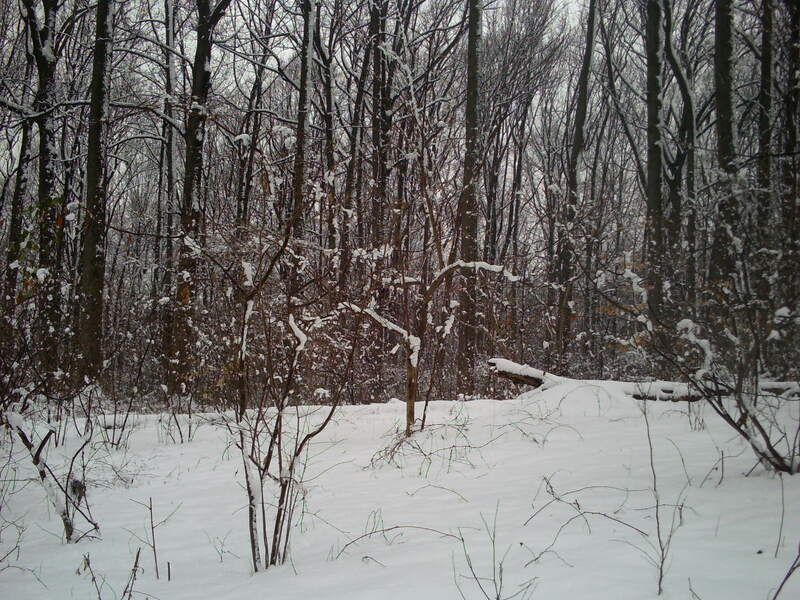 It was the Norway Maple grove (Acer platanoides) growing not far from the house, in a blighted area, so full of invasives it has actually been de-prioritized from invasive removal projects in favor of areas with large and diverse native populations at risk of emerging invasives. 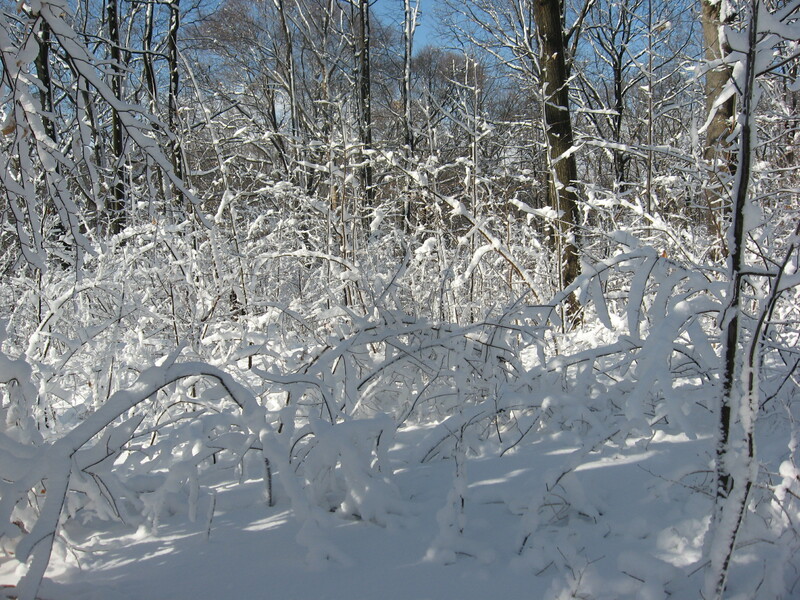 The forest was a pretty sight, the job of shoveling the front walk and the sidewalk was not. Always the worry of getting salt on the garden. Last year it was very possible that salt caused our cultivated wild Ginger (Asarum canadense) to have brown spots on the leaves. The Rosebay Rhododendron (Rhododendron maximum) is such a good sport under our tenure. It is doing much better since we planted it in the yard after we left it in its nursery pot in the back alley for the entire summer of 2007, hardly watering it. In the upper right section of the picture, the carnage is visible. 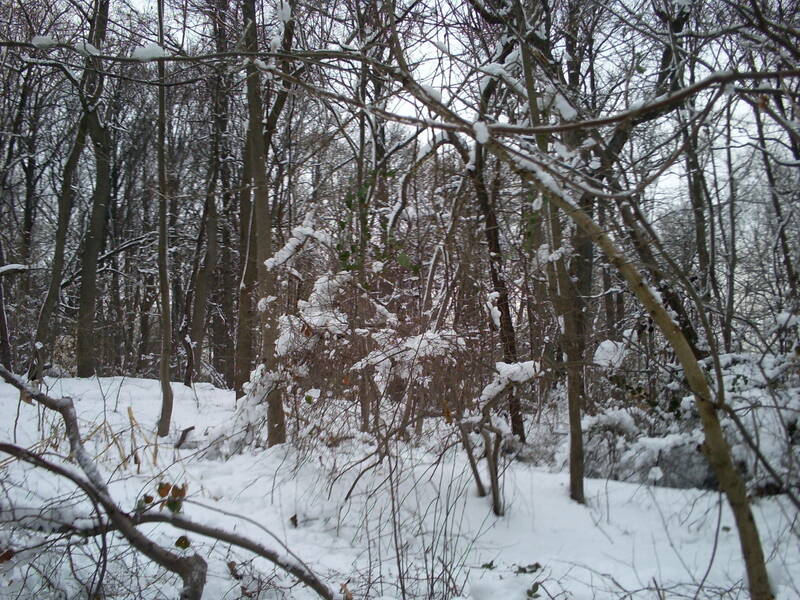 These invasive trees introduced from Europe, are dominating this one area, shading out native plants and trees with their dense canopy. 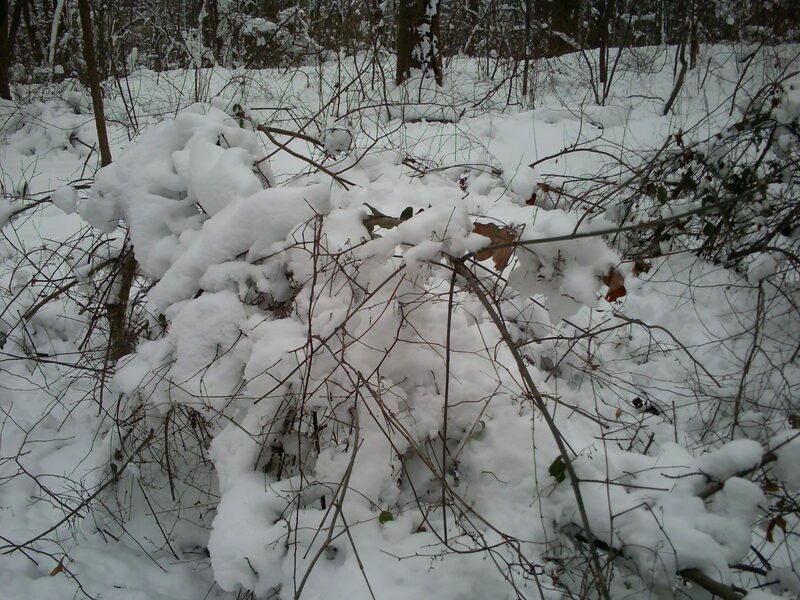 They were covered with grape vines (Vitis spp.) 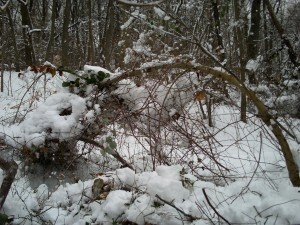 and the vines were so dense on the trees, that they caught enough snow to weigh them down to collapse at 10:00 last night. This is not a loss at all for the health of the forest, however we have found many, many native and ecologically important trees destroyed by this process. 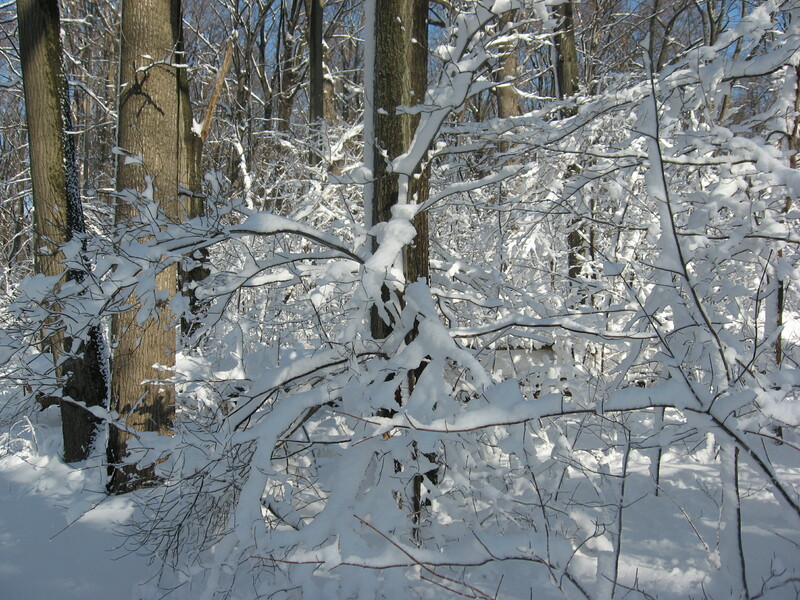 Some of the most vulnerable native trees destroyed by the combination of Grape vines and snow are Tulip Poplar (Liriodendron tulipifera) and Sassafrass (Sassafrass albidum). These are both fast-growing pioneer species, important in forest regeneration, something we take very seriously in an urban degraded forest situation. However, the cost to their rapid forest-building characteristics is their weak wood, easily broken in a compromised position. Grape is a forest edge vine that does contribute food for birds and has an ecological value. It is generally found on the rivers edge, or on other edges of forests. 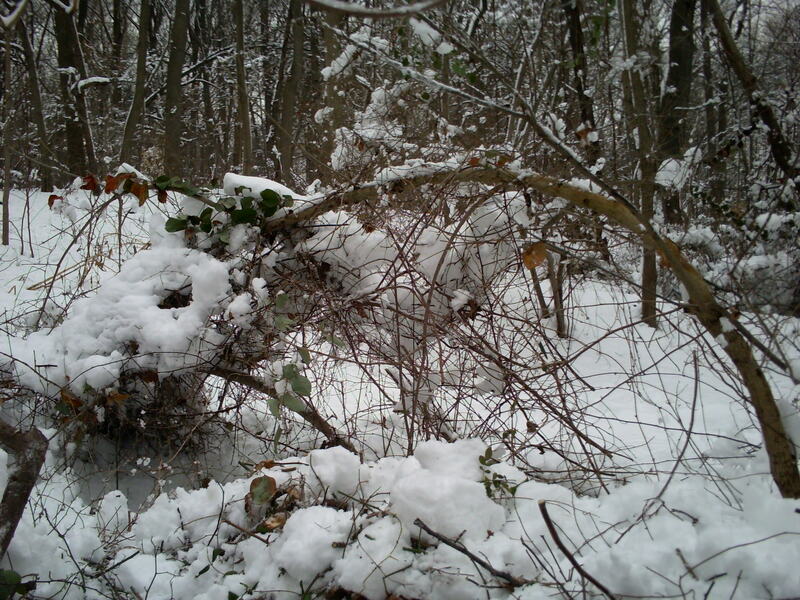 However in a disturbed urban forest, the grape vine thrives, so much so that it maintains a forest edge state by overtaking any and all trees that try to grow. 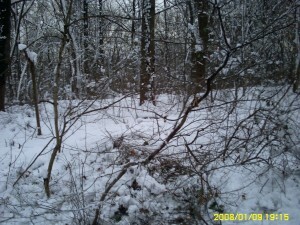 In this state, other invasives such as Oriental Bittersweet (Celastrus orbiculatus) and Japanese Honeysuckle (Lonicera japonica) among a whole host of others, also climb over the tree saplings, creating the inpenetrable thicket, the death knell of the potential forest. In the final stages of this commonly found environmental degradation, a monolithic aggregation of just a few species of plants remain. Contributing little or nothing to native birds and insects, what is left is a dead zone, completely incomparable in value and quality to the original forest that was once there. 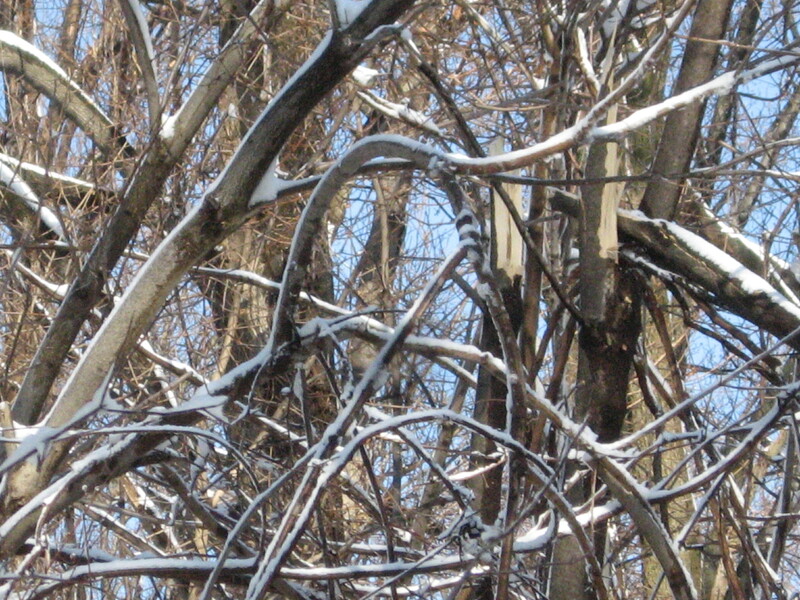 Here, the invasive trees are being toppled by the native Grape vines (We are not absolutely sure of the native status of the local population, actually). When an ecosystem is out of balance, all kinds of things can happen. 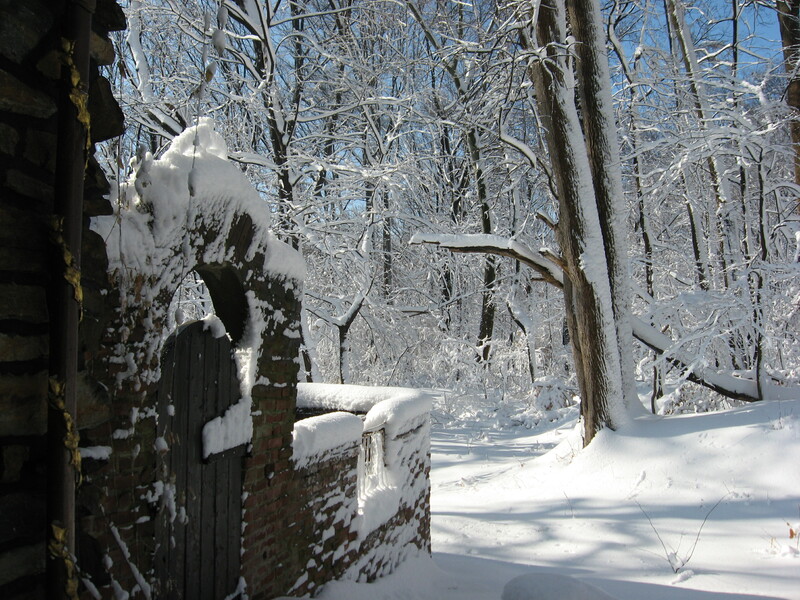 The snow brings so many striking contrasts and great shadows. The forest we are used to on a day-to-day basis has been transformed drastically and with such a beautiful effect. 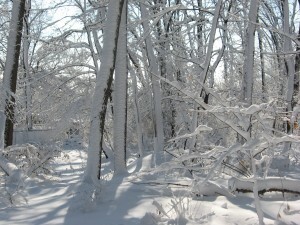 This winter we have had so many different types of snow events, each one with a unique stamp on the forest. 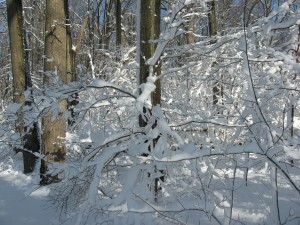 This most recent snowstorm is most characteristic of a mature winter in our Mid-Atlantic, Piedmont location. 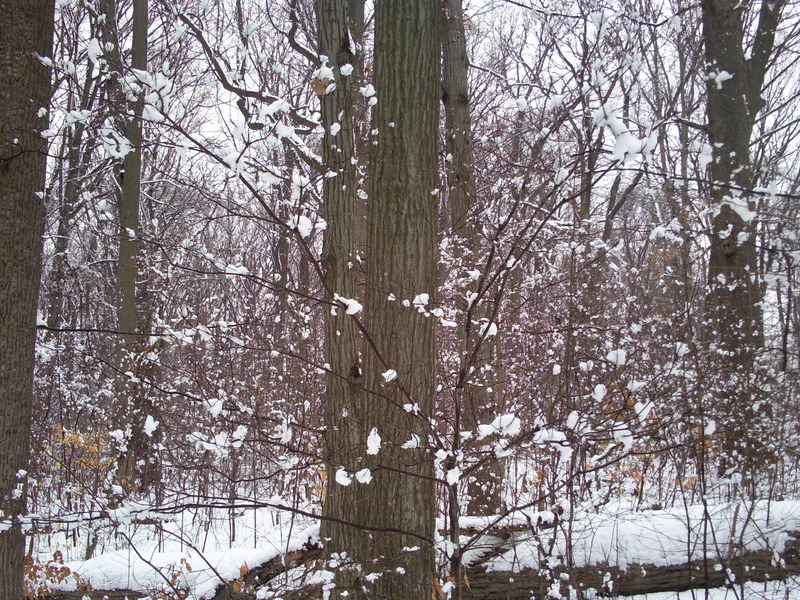 So interesting how the snow collected on this fairly young Tulip Poplar. 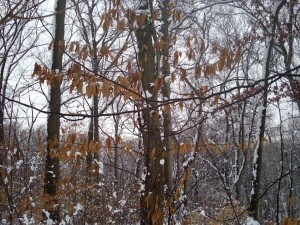 Here, the Beech tree is really weighed down by the snow attached to the leaves still on it’s lower branches. Why the leaves stay on through the winter is still a mystery. What evolutionary advantage does this have? In this area, after this snowstorm, the rubber meets the road. This is an area where we have removed many vines off of these trees during the fall, with this very situation in mind. 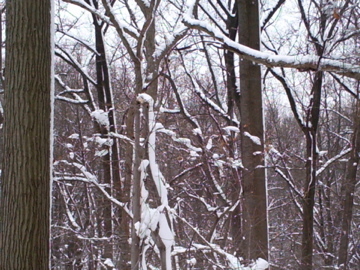 The little trees are holding their own and are not broken or splitting. This picture is a testament to our success. 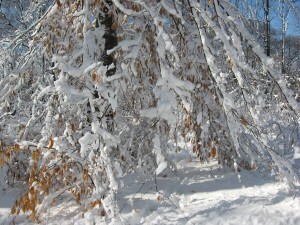 For the winter of 2010-2011, these young trees are saved. What a beautiful way to see our achievement. 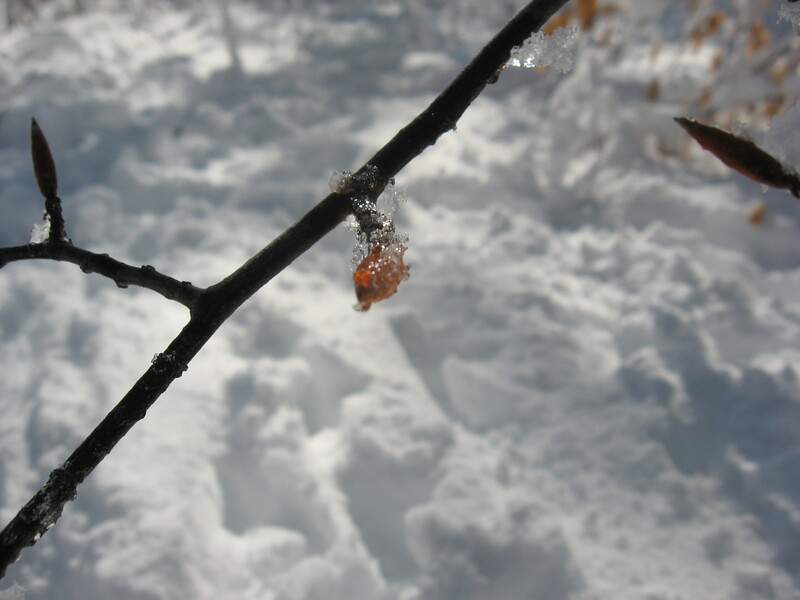 The Beech (Fagus grandifolia) buds , here covered in ice, have a red color, beautifully illuminated in the sun. 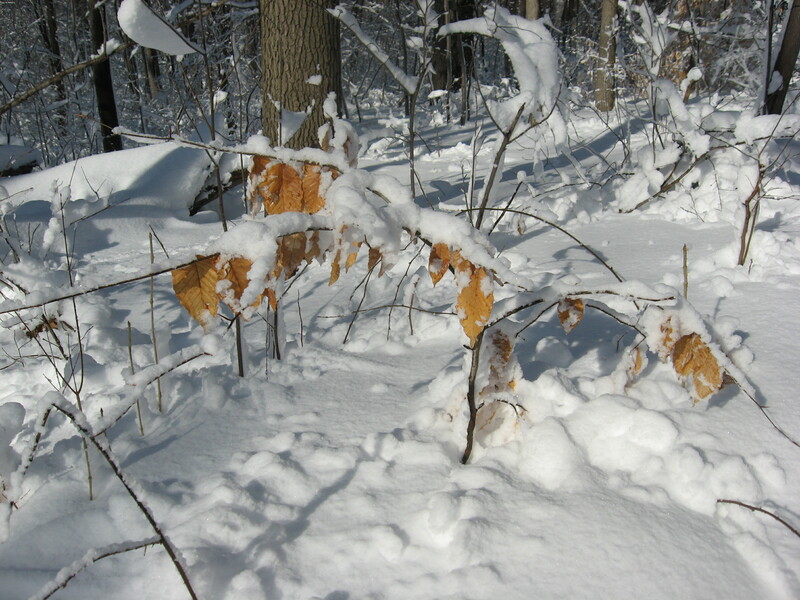 Just yesterday in the “wintery mix” discussion, this very tree was illustrated as a Fagacae family member holding onto its leaves in the winter like the Beeches and the Oaks. Now its bent down under the weight. Just yesterday, again, this Dogwood tree (Cornus florida) was featured, with little clusters of snow mimicking its spring flowers. 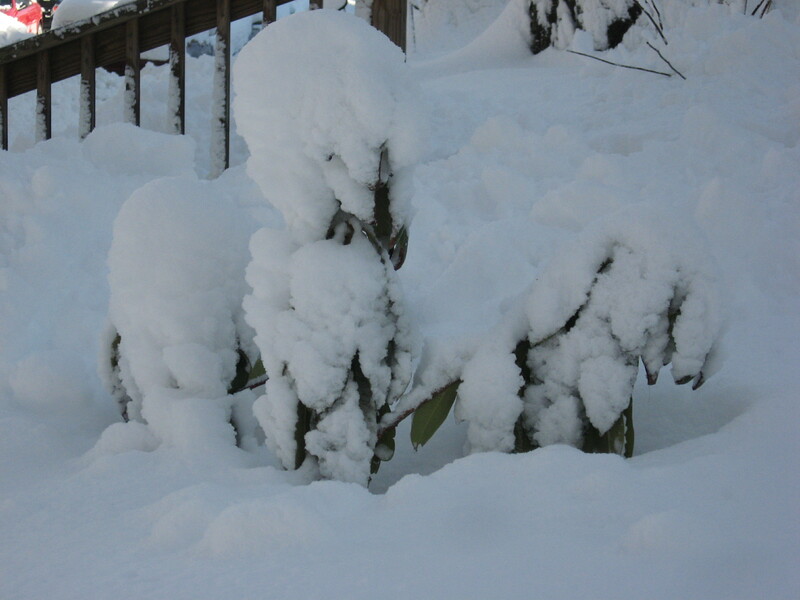 With a little imagination yesterday, that was possible, that a little winter snow could resemble a spring inflorescence. Not so today. This is a whole different scene. Yesterday was the make-believe. Today is truly winter in all its glory. So, if its going to be like this, we wont mention spring anymore then. Not for now at least. We hope that this one will make it through these challenging times. Early this morning a heavy, wet snow has fallen. Caught on the millions of branches of thousands of trees and shrubs, this makes for an astounding visual landscape. 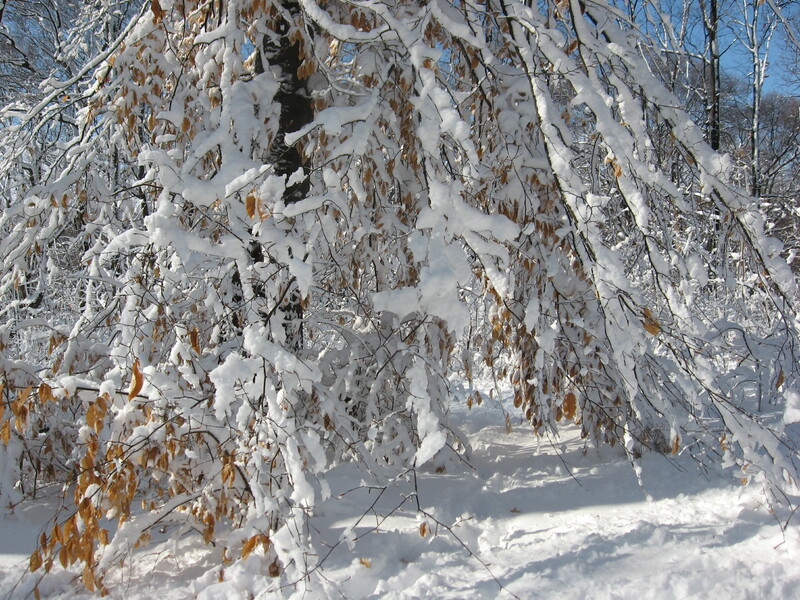 The sounds of the city are muffled and the fresh powder is pleasant to walk through. 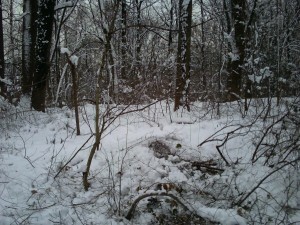 This photograph is taken at the exact location of the first photograph in the intro to the Sanguine Root, where the bloodroot patch grows. This area was an early restoration project for us. 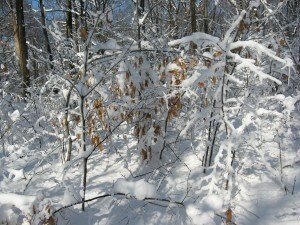 The multi-stemmed spicebush (Lindera benzoin) in the foreground was not much more than a lump under a network of Multi-flora Rose, Oriental Bittersweet, and Japanese Honeysuckle. 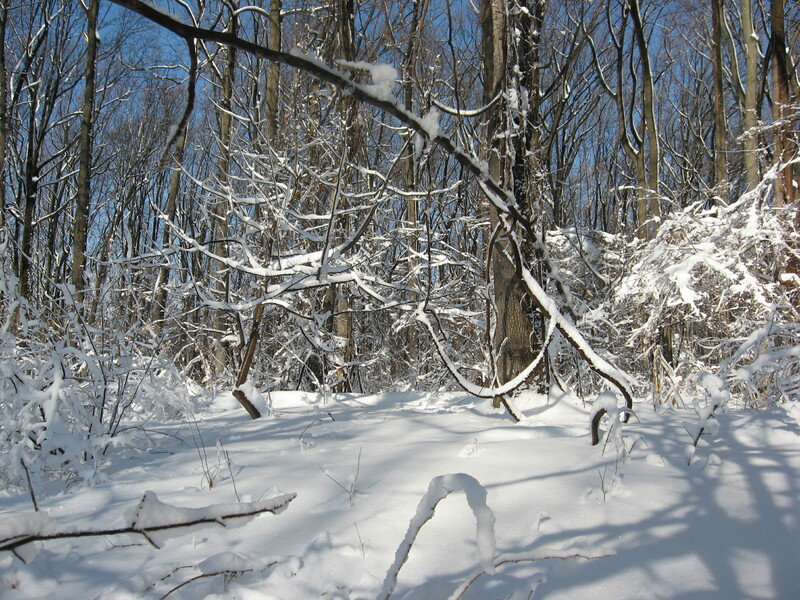 Now, three years later it is a thriving part of the forest understory. Although we haven’t seen it yet, Spicebush is the host for the Larvae of the Spicebush Swallowtail butterfly (Papilio troilus). Spicebush is also a great source of nectar early in the season. Tulip Poplar (Liriodendron tulipifera) saplings are now growing in the area. 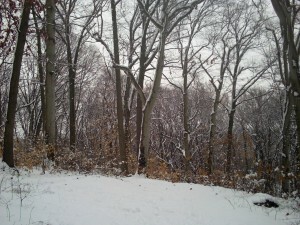 The backround forest in the picture is a startling batch of mature Tulip poplars. 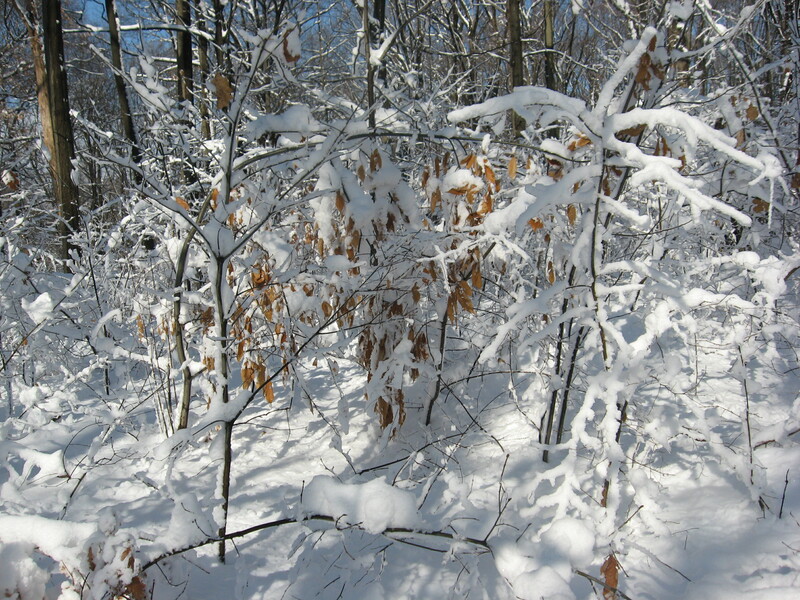 Also uncovered in the project area was an American Elm (Ulmus americana). Every year we have to return to this site to remove Multi-flora Rose, Bittersweet and Japanese honeysuckle seedlings. Most recently, and with great alarm, the newly emerging invasive Mile-A-Minute (Persicaria perfoliata syn. Polygonum perfoliatum) was found for the first time on this site. Not surprising being that there is an infestation of this in the park near the entrance to Lotus Road, maybe 400 feet away. We are extremely vigilant about this emerging invasive. While out of our current project scope, the Mile -a-Minute infestation is being taken seriously by Fairmount Park staff, who have organized a volunteer event which we participated in, to remove the invasives in this problematic area. 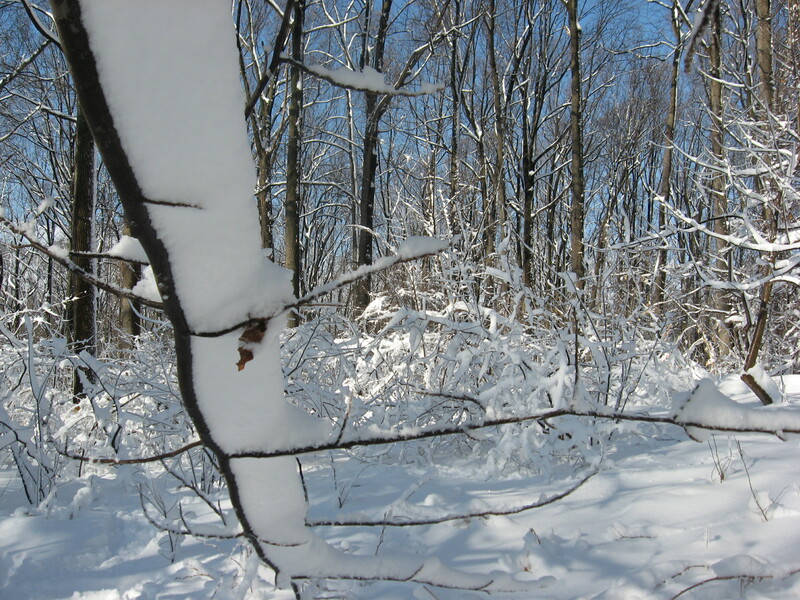 In the heart of winter, Mile-a-Minute, an invasive from Asia, imported to Pennsylvania in the 1930s, is the last thing we think about. 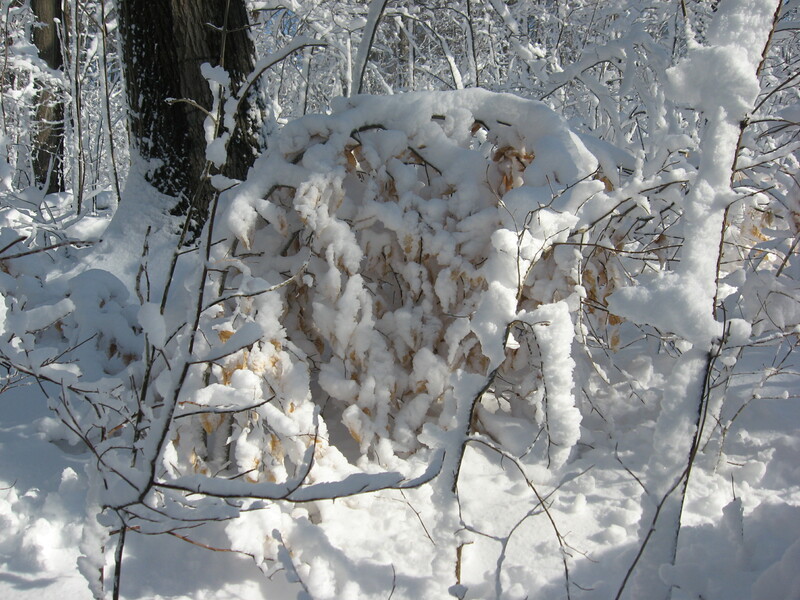 It is an annual that dies back in the winter, but re-seeds itself vigorously and grows like it’s namesake. 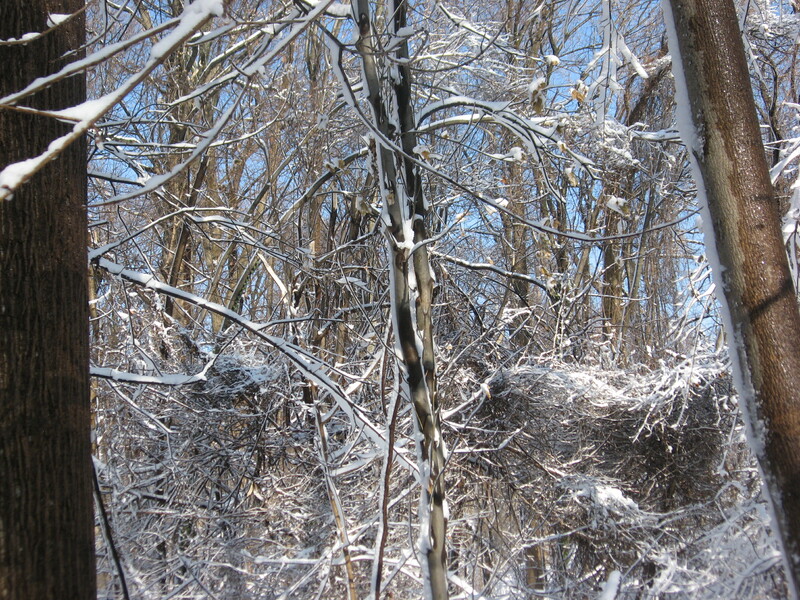 The snow collected on this beautiful woodland specimen of Flowering Dogwood (Cornus florida) this morning. 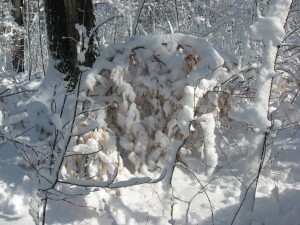 In a sense, winter created a faux inflorescence on this dogwood tree, with little balls of snow mimicking a floral display. Look at that! Who needs Spring when we can have this? 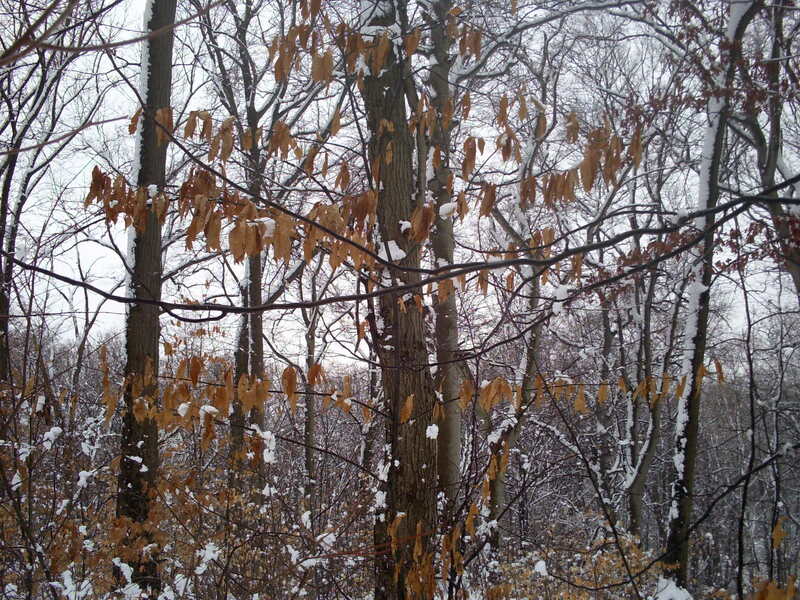 In perfect Fagacae form, this Chestnut tree is holding its leaves into the winter, like the beeches and oaks in its family. 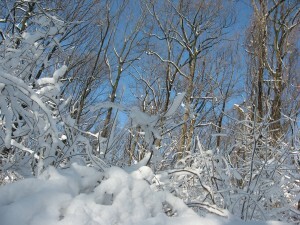 In this picture, note the line that demarcates the tops of the trees and the sky. 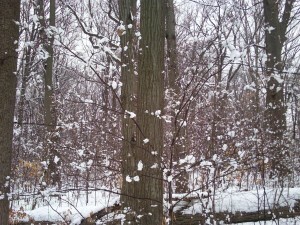 This Chestnut tree is growing on a plateau situated next to a slope that drops down to Indian Creek. 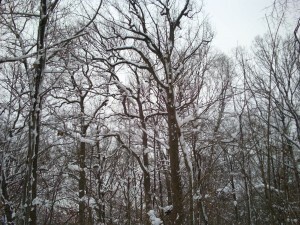 The tops of the trees in the backround, not much above eye-level, are almost mature oaks, beeches and Tulip poplars. 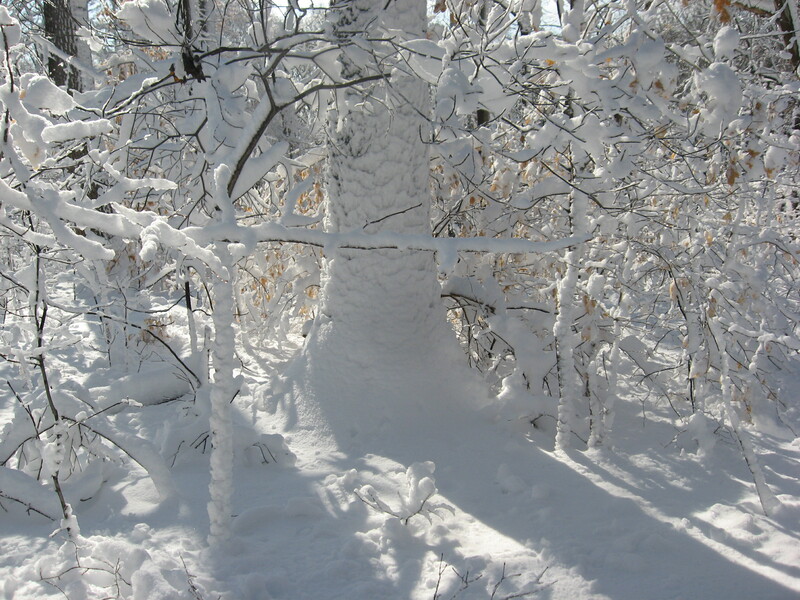 This image demonstrates the height of the plateau, as well as the degree with which the slope precipitates. 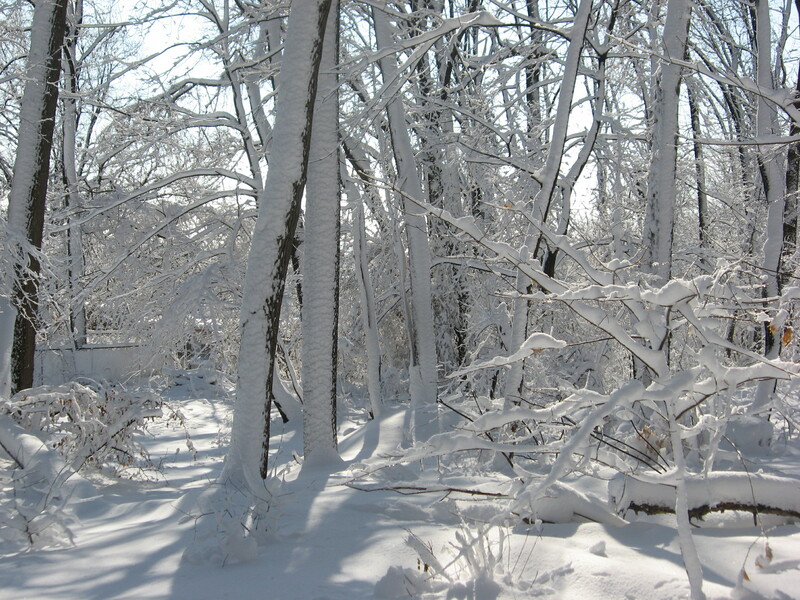 The winter time is the best time to photograph or just visualize for yourself, the lay of the land, where geographical qualities such as slope grades, floodplains, and hilltops are the most visible. In front of the beech tree at center is a trail, which we call the ‘Upper Trail’, which follows along the top of the hill, tracing the contour of the landscape. This makes for a pleasant woodland walk, with great views, and a gentle slope. There are several points along this trail where new trails break off, dropping down to Indian Creek, giving us the opportunity to visit the creek and its environs. 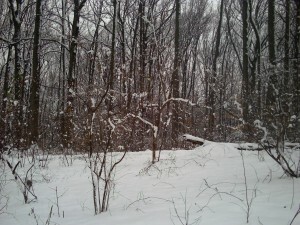 Another trail follows along Indian creek, which we call the ‘Lower Trail’. In the photo above we get a sense of the landscape. 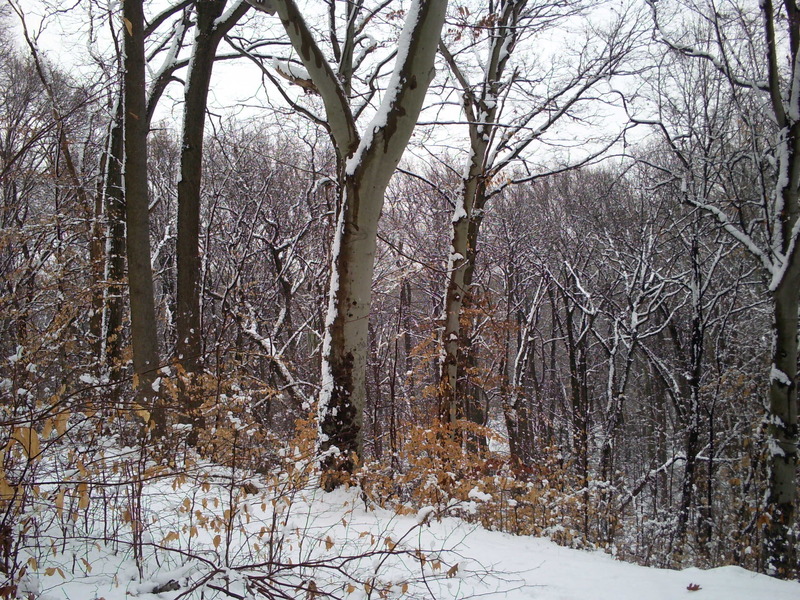 A ravine lies behind that Beech tree. A precipitous drop, created by Indian creek over millions of years of erosion, makes for the transformation of a woodland walk into a hike. 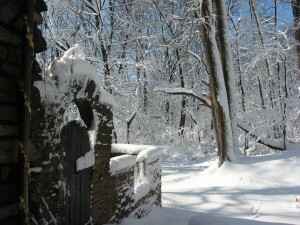 This edge of the plateau area displayed in the past few photographs is our favorite part of Morris Park. 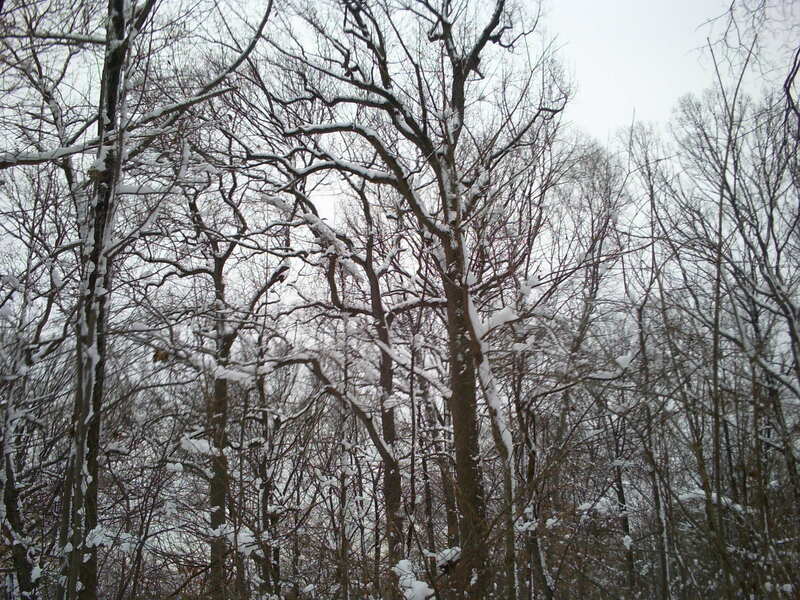 There are very few invasives in this area, a great amount of mature oak, Beech, and Tulip Poplar trees, and a large amount of smaller trees in various stages of maturity. Also a great diversity of native flora, from a bounty of spring ephemerals, a shrub layer, to summer and fall flowering plants, a diversity of mushrooms and parasitic plants. 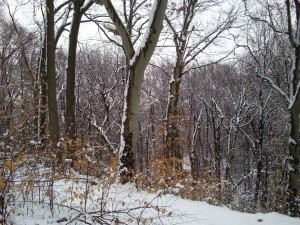 The area gets great summer breezes and commands a spectacular view of the Indian Creek ravine.